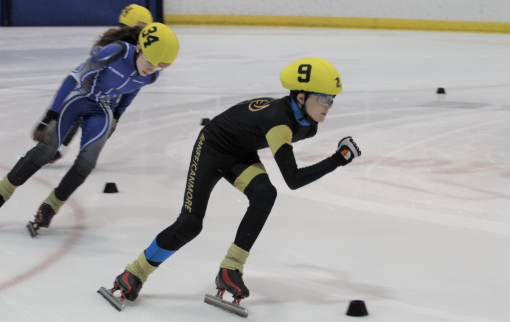 While the name of the sport may suggest it’s all about speed, having fun and building confidence on the ice come first at Banff Canmore Speed Skating Club. If you’re new to the world of speed skating, it’s a form of ice skating in which competitors race against each other, typically around an oval track. Robin Bortsmayer, Vice President, says the Club is focused on helping kids and adults build their skills in a safe and welcoming environment – speed can come later. Banff Canmore Speed Skating Club is led by a team of parent volunteers, as well as two coaches: Ian Mellor, based in Canmore, and Ryan Hickman based in Calgary. “It’s quite common for kids to skate for a couple of years before going into the racing. We host club meets three times a year, and they are a really good introduction for kids who love skating and want to see what the racing side is like,” Robin says. Members practice three times per week, including at the 400-metre long track at the Calgary Olympic Oval. In addition to attending regular training sessions, members are encouraged to participate in Club Race Nights and to compete in various local and provincial meets throughout the season. The Club offers both short track and long track skating. As the name suggests, the main difference between short and long track is the size of the track. 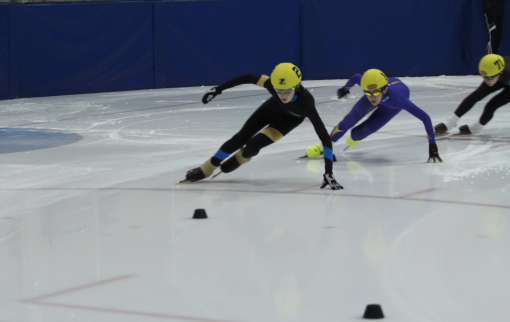 Short track races are conducted pack-style around a 111.12m track, while in long track, skaters race in pairs in their own lanes around a 400m track. “It’s short distances – four or five people on the line at once, a little bit like roller derby – on the short track. Most kids would start off with short track because it’s a more accessible environment, then if they want to later on, they can cross over to the long track,” Robin says. Robin says that while many winter sport enthusiasts will take to the ice very naturally, speed skating requires athletes to develop a unique skillset. “It’s a significantly different technique to ice skating or hockey skating. It’s a learning curve for sure – and a whole lot of fun,” Robin says. The Club marked a strong winter season in 2016-17, sending six skaters to a Canadian western championship qualifier in Calgary. Among the Club’s most notable alumni is Conner Howe, who helped power Canada to a bronze medal performance at the World Junior Long Track Championships in Helsinki, Finland in 2017. This winter season, the Club will be travelling to Wood Buffalo, Northeastern Alberta, to compete at the Alberta Winter Games, in February 2018. “We welcome anybody who would like to try speed skating. We’re proud to share our passion for this sport and we want to make it easy for children, teenagers, and adults of all levels to experience it in a safe and accessible way,” Robin says. Showcasing two key principles of True Sport, Have Fun and Include Everyone, Robin says the Club’s friendly community is delighted to welcome new members of all ages and experience levels. Banff Canmore Speed Skating Club offers two sets of one-hour “Try It” sessions for free, which include coaching and speed skate rentals. These free sessions are available to anyone during the speed skating season, which runs from September to March. So get ready, grab a helmet and lace up some skates, because you’re about to have a whole lot of fun on the ice! 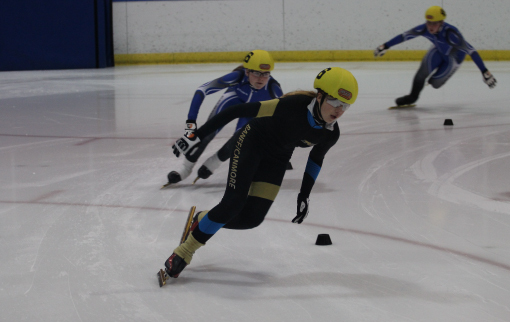 The Pauw Foundation is proud to support Banff Canmore Speed Skating Club through its Youth Sport Fund, as part of promoting an active and vibrant community in the Bow Valley.